I have posted pictures before with my running buddy, Kristy. And I have written a post about her youngest daughter. What I didn't tell you was that Kristy was a single mother for a full year while her husband served in Iraq. He left in May 2009, and recently arrived home, safe and sound. We didn't see much of them last summer, right after he was deployed. To be honest, I didn't know her all that well back then. Just enough to chat with her while her daughter played tee-ball with Middle. Then football season started. Her son was on Eldest's team. Hubby and our neighbor Joe took care of her home maintenance. And helped her finish their basement as a surprise for her husband. They did all this without a second's thought. After all, he was over there. Fighting. For us. Fall turned to winter. Winter turned to this spring. Kristy received her RN degree while her husband was away. And finally, FINALLY, her husband returned to his family. Last Friday night, they came over to our Trenches to visit. Oren (Kristy's husband) wanted to make sure Hubby and our neighbor Joe would be there because he wanted to give them something. I figured it was a gift certificate or something. Oren was all serious. He spoke about how he wasn't worried about being overseas. That he wasn't really concerned about being shot. He was more concerned about leaving his wife and 3 children behind without him for a year. And how Hubby and Joe helped to relieve that stress for him. How he could focus on staying alive because he knew his family was being taken care of back here. And that there were no words to repay them for easing that burden. 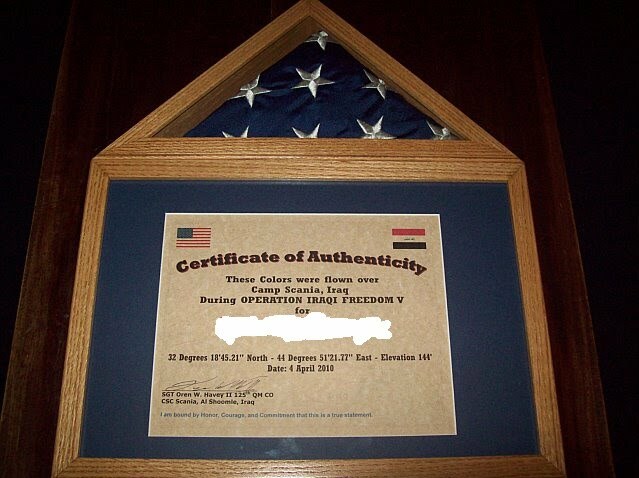 And then he presented each of them with this, showing that he had had a flag flown in each of their honor in Iraq. Hubby and Joe both welled up with tears, speechless and beyond touched. This keeps everything in perspective. Wow, that is just lovely. That's so amazing. And, yes, keeps everything in perspective. How wonderful for all of you!! WOW !! That is wonderful. Thanks to Oren for serving ! Wow, that is SO amazing! I am crying! That is so touching. Such a wonderful thing for him to do for them. Especially when, I am sure, a simple "Thank You" would have been enough. Wow, what an amazing honor. Thanks so much to Oren for serving, and for your husband for being such a great neighbor and friend. That is amazing! And yes, totally does give you prespective. It's always such a sweet moment to see how what one person does so naturally (helping her out without second thought) means so much to someone else. What a sweet gesture that your family gave them so much support. 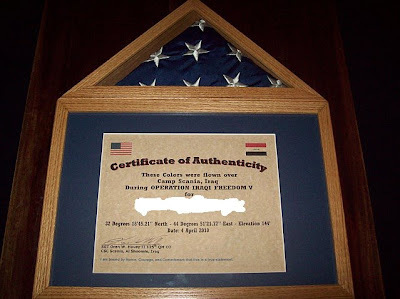 Very cool gift he brought back as well. So thankful that he stayed safe and made it back. This post totally rescued my day. Amazing. I ran into Oren the other day and was brought to tears that he is back where he belongs safely. Grateful for his service but glad he is home. You guys are amazing friends. Good Job! Please pass the tissue box. How wonderful of your husband and Joe, and all of you, to be the support system for this family. My brother is career USN, so our extended family is no stranger to what the deployments are like. Thank you for being that hero's heroes. I'm teary eyed. What a wonderful gesture of appreciation. I even got a little teary.